Is it that time already? 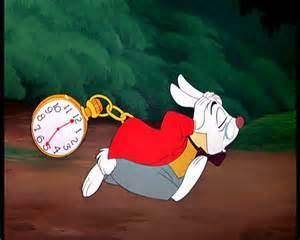 I am laying down, tired as can be… I imagine the white rabbit say, “you’re late, you’re late.”. As he is pointing to his wrist watch. It’s time to go, time to go to Mothers house. Her house will still undoubtley, smell like Christmas. All of a sudden, the telephone rings and it’s… Mom. Her voice in a hurry tone, tells me she is running late. What a surprise, so am I. She is baking all kinds of treats, to take to her husband family, as they are still celebrating Christmas. I say, “don’t worry, I will be there soon.” Or will I…? Yes, I will be there. Sometimes, we do things out of the goodness of our heart, other times we do not.